Philosophically, I'm an existentialist. Always have been. And as an existentialist my main preoccupation is finding meaning in the face of death. I think about death all the time. I enjoy cemeteries. Much of my research is about death. I read books and poetry about death. You would think that all this death awareness would ruin me emotionally. In college it almost did. And in the face of this existential panic I became acutely aware of the fact that believing in life after death was a deeply consoling belief. So powerfully consoling that it seemed almost a trap. This easy little fix, one teeny weeny little belief, could dramatically eliminate the deepest existential terror in the human experience. It just seemed too easy, too neat, too quick, too clean. So I resolved to do a very peculiar thing. I resolved to keep death in view--constantly, daily. And if you've read a lot of my work on this blog, then you know how I continue to work through the dynamics of holding onto faith while simultaneously refusing to allow faith to repress death anxiety. I try to hold both--faith and death--firmly in view. And why, you might ask, would I intentionally engage in this odd and existentially unsettling activity? Why not let faith eliminate or repress my death anxiety? Because this path of mine is the only way I know of which can assure me that my faith isn't, to use Sartre's term, bad faith, that my faith has nothing to do with repressing death anxiety or awareness. Still, I have to admit that it is hard to live with death on a day to day basis. So in college I began searching for a way to make death my friend and companion in life. If death and I were going to spend a lot of time together we needed to figure out a way to get along. Once again, George MacDonald helped me. Many consider At the Back of the North Wind to be MacDonald's masterpiece. It is a fantasy work about a little boy named Diamond. One night Diamond tries to shut a hole in his wall to keep out the howling North Wind. Eventually he (with the help of his mother) succeeds. But the North Wind, manifesting as a beautiful woman, soon appears in Diamond's room asking why he shut her out. So begins Diamond's adventures with the North Wind. As their friendship grows we discover the gentile, beautiful nature of Diamond. We also learn a bit about the North Wind who can be both gentle and harsh. During one adventure Diamond is allowed to see the land at "the back of the North Wind," an idyllic land of peace and beauty. We also come to discover that Diamond is a sickly child and we begin to wonder if the North Wind is his companion for reasons related to his health. Who, exactly, is the North Wind? In the final chapters Diamond pushes the North Wind for answers. Diamond wonders if the North Wind is real or only a dream he's been having. And if the North Wind isn't a dream then who is she? "I think," said [the North Wind], after they had been sitting silent for a while, "that if I were only a dream, you would not have been able to love me so. You love me when you are not with me, don't you?" "I think not. You might have loved me in a dream, dreamily, and forgotten me when you woke, I daresay, but not loved me like a real being as you love me. Even then, I don't think you could dream anything that hadn't something real like it somewhere. But you've seen me in many shapes, Diamond: you remember I was a wolf once—don't you?" "Oh yes—a good wolf that frightened a naughty drunken nurse." "Oh yes, I do. How cold you were, North Wind I and so white, all but your lovely eyes! My heart grew like a lump of ice, and then I forgot for a while." Diamond had fallen in love with Death. And Death was, essentially, a friend. Here at the end of the story the North Wind wants to know if Diamond would still be able to see the beauty at the core of the North Wind despite her many terrifying manifestations. "No. Why should I?" he answered. "I only felt a little cold." Four days after, I called again at the Mound. The maid who opened the door looked grave, but I suspected nothing. When I reached the drawingroom, I saw Mrs. Raymond had been crying. "This morning we found our dear little Diamond lying on the floor of the big attic-room, just outside his own door—fast asleep, as we thought. But when we took him up, we did not think he was asleep. We saw that---"
What a sad way to end a children's story. But the ending is consistent with the theology of the book. 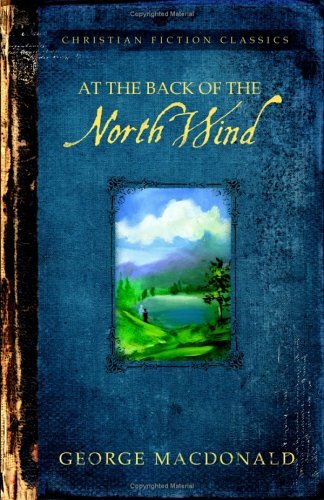 Essentially, At the Back of the North Wind is a story about the friendship between Death and a little boy. Death was Diamond's playmate and companion. And he loved her. And in the end he passed through her to get to the land at the back of the North Wind. At the Back of the North Wind played a critical part in helping me hold onto faith while keeping death close by as friend and companion. Importantly, At the Back of the North Wind isn't triumphalist or death-denying. 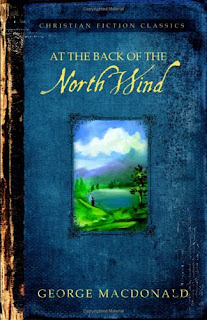 As you can tell from how the book ends, At the Back of the North Wind is sweet but very sad. And throughout the book the North Wind is often cold, inscrutable, terrifying and horrible. But the book asserts that, at her core, the North Wind is beautiful. She is a friend, a companion, and a doorway. The story is so very sad. Yet so very hopeful. When my mom was diagnosed with breast cancer she came to Texas to get treatment at MD Anderson in Houston. I took off work so I could drive mom to her appointment. And what does a mother and son talk about for five hours driving toward a cancer diagnosis? As I prepared for the drive, Angie, my good friend at work who is a cancer survivor and received treatment at MD Anderson, tried to prepare me for my time in the hospital. In her experience at MD Anderson, waiting hours and hours for appointments and treatments, she observed that many family members of cancer patients have a difficult time in the waiting rooms. The waiting rooms are full of people at various stages in their battle with cancer. Some are just getting the diagnosis. Some are battling through difficult chemotherapy, their hair gone and faces hollow. Many are at the end of the line, all treatment options now exhausted. Angie wanted to warn me about what I'd see, about the sheer weight of death and sadness in the MD Anderson waiting rooms. I told Angie not to worry. Facing death wouldn't make me sad. Because it makes me sad every day. Every day I think about how crushingly sad it is for people to pass through the North Wind. To leave behind loved ones, unfinished projects, and life dreams. It's all just so sad. Poignancy. That is how I feel about life. That is the feeling of my faith experience. And I feel this way because, like Diamond, I've made the North Wind my friend and companion. She makes me sad very often. And sometimes I'm so very afraid of her. But I believe, like Diamond believed, that despite appearances the North Wind is a friend, that she is, in the end, beautiful. I cherish her as my friend because, like it or not, she is my door. And I'm eager to see the back of her, to pass on to that land at the back of the North Wind. You might be interested if you haven't already explored this, in the practice of Capuchin monks of doing "bone mosaics". Covering walls of chapels and crypts with human bones as a form of contemplation of death. Franciscan monks as part of their religious practice spend a lot of time contemplating death and creating art that reflects this intimacy. A crypt I visited in Rome, for example. Thank you so very much for this post! This may very well be my favorite one yet. One of the reasons I return to your blog is because I see myself, my thoughts and my experience in your writings. You sir, have the ability to put into words the things I have never been able to verbalize. Thank you for that. On my way home from work yesterday I was wrestling with some of the things you talked about in this post. I, too, have kept death very close to me. Where you and I differ is that I have, at times, become depressive about death. I have glimpsed the good of death from time to time, but eventually I come back to the sadness and fear. It never dawned on me to make death a friend. This is why this post is my favorite: you have paved the way for something that was my enemy, the bane of my existance and showed me that the North Wind and I can be friends. I thank you most of all for that. I follow your blog "religiously" because of the consistently thoughtful, insightful and challenging ideas you discuss. But also because your perspective and outlook is so resonant with my own - though much more poetic and erudite! This post in particular is encouraging and moving. Thanks for sharing! I'm a musician and lately I've found my songwriting informed by the very same ideas you've written up so well here. George MacDonald is such an abundant source of the poignancy that you are describing. Now I've got even more to chew on. It may be dangerously in the territory of Satre's "bad faith" --- but often I feel that the North Wind is the only thing that keeps me alive in a life of faith, no matter how dim it has seemed in the face of doubts and uncertainty. I could see how someone might see this the way the Misfit does in Flannery O' Connor's "A Good Man Is Hard To Find": "She would've been a good woman if someone had been there to shoot her every day of her life." I have this silly theory that "self" is developed not primarily along sexual needs (Freud) or security needs (Maslow), but by lifelong coping strategies resulting from the certainty and finality of death. Friday") by design. Today being a commemoration of His death, it makes me ask about phrases in the text regarding His VICTORY over death, phrases like the death's sting, and death and Hades being cast into the lake of fire as if to abolish death forever. At a generic top level the bible seems to present death as a bad thing. Death doesn't seem to be a prospective friend here. However, I resonate very deeply with this post and the excerpts from that story. Coincidentally, I've been reading MANY Near Death testimonies the last few days. I think I understand a bit of what you were articulating in the latter portion of your text when you used the word poignancy. Memorable death and resurrection weekend to you and your family. Before I started this blog I'd always felt that my faith journey was bizarre, that no one felt the same way I did about things. It's nice for all of us to have found each other. I'd also like to say that keeping death close is one of the best ways to force you deeply into this life and into the lives of the people around you. Death reminds me that every moment is precious. So I try to live deeply. In this sense, an awareness of death helps me live the resurrected life today, in this moment. Because even if there is a heaven I won't, I expect, be there tucking my boys in at night. So I have only one go-round with this. I have a finite number of bedtimes in my life. I shouldn't waste a one. I have life today. So live. As a VA Chaplain who experiences death and dying sometimes daily, I think in one sense you are right and full of beans in another. Experiencing death imaginatively is emotionally and intellectually bracing, humbling, and clarifying and can lead to profound reflection. Experiencing death "existentially" in reality and often, especially when one knows the one dying and then deceased, elicits numbness and all the various grieving emotions which are not contained within the imagination but which are named by the imagination. Actual as opposed to imagined death can only be managed by caring for the remains, by ritual and, later, by story, by the memento mori. For me, I hate actual death and have come to be angered by death. The words of Dylan Thomas express my feeling and my thoughts: "Do not go gentle into that good night; rage, rage against the dying of the light." My guess is that anger was the emotion of Jesus when he said on the first Good Friday: "My God, my God! Why hast Thou forsaken me?" Richard, as a reader of your blog for several years now, I've always appreciated the candor and insight with which you articulate your views. This post in particular really resonates with me. As a fellow winter (or at least late fall) Christian, I have no sense of certainty whatsoever of a heaven. I hope it exists, but that's as far as it goes. Even if I could be certain heaven awaits, I'd still find it to be little consolation in this life when wrestling with grief over the loss of a loved one or facing my own mortality. The transience of earth-bound joys--time with my wife and daughter, conversation with friends, etc.--coupled with the inevitability, tinges life with melancholy for me. In fact, few days pass that I don't think about death in some way. Grow longer in the tooth, so why do people fake it? Richard, thanks for these thoughts. One of the nice things about blogging these last few years is that I've discovered I'm not so crazy after all. I don't know that I could ever make Death my friend; but maybe an enemy for whom I have a great deal of respect. Speaking of a meditation on death, living here in southern California and ironically in the midst of the celebration of Easter / Resurrection, the 7.2 earthquake centered just below the border in Calexico / Mexicali didn't hurt as a reminder of how near death always looms. According to NBC this morning, there have been 2 total deaths reported so far in Calexico / Mexicali. Death has been winding its way through our past year. My Dad died at MD Anderson last May, followed by 2 more deaths within the next couple of months. Dealing with my mother's widowhood (this Easter was the first since 1952 when they met on a blind date that she had not been with my Dad) is hard. My Dad's absense is a tangible void. But it has been something like what Lewis described at the death of his friend Charles Williams. Having tasted the brink of death myself when my first child was born (medical staff worked on me for 2 hours to get me stable), if what I experienced wasn't mere illusion, then I do think George MacDonald's theology of death is truer than, at least, Baptist theology. And at the time, I had not yet discovered MacDonald. Great post. The North Wind story reminded me of Neil Gaiman's comic book series The Sandman and its recurring character Death who is portrayed as a nice and friendly teenage girl. I so relate to you. When I was a child I used to contemplate death so constantly that I am sure I would have been put on Prozac if I was a child today. Thankfully it was in the 80's. Today I still think of my impending death on a daily basis. But with far less darkness or fear - not that I can't find intense darkness or fear if I should choose to contemplate those aspects, but I suppose I just know that those emotions for me at this juncture aren't as productive to be felt on a daily basis so I save them for more appropriate times. Instead, death to me is a daily sobering motivator to take life soberly and seriously. I don't want to die, but it will come for me and could come when I least expect it. It's sorta nice to run into someone else who is able to roll with such conversation and finds it worthwhile to face death and its mysterious unanswered questions head on, looking the inevitability in the face, with all the blood and guts that most polite people avoid. I'm glad to know you. And was it not Jonathan Edwards who wrote those "Resolutions" where he resolved to think daily about the occasion of his death, as a positive spiritual exercise? Sounds morbid and unhealthy to modern readers, but I think there was something worthwhile and healthy for him and us in it. I tell the Lord sometimes that I am scared of what it will be like. I felt Him whisper in return to me one day, "You concern yourself with living, and I will concern Myself with your death." Sounds...like the most realistic comfort I can take on the topic. Reading this to my sons right now - beautiful, thank you. I recently had an intense, life-changing revelation. I nearly went insane and spent over 2 weeks in the hospital, diagnosed with hypermania. I found At The Back Of The North Wind in the hospital (I think left for a purpose), and it described my situation perfectly. I did not die/visit the back of the North Wind, but the North Wind was synonymous, for me, with the voice of God that resonated in my head, providing infinite wisdom. It turned me from a pond into a river, and all my fears and limits became intransigent no longer. This was what happened to Diamond. Diamond the Horse represents Christ, and Diamond the boy the enlightened man. He goes from fearful, timid, and non-communicative to fearless, infinitely courageous, and ultimately communicative. The room of boards over the stable was his mind. It is oriented in a specific position and cites Orion (I think MacDonald may have meant Cygnus, a star formation seemingly referred to in Egyptian pyramids; the allusion was attributed, until fairly recently, to Orion) and the North Star as landmarks. The garden outside the house is Paradise, the garden of innocence, and his and Her's (The North Wind's) story is that of Adam and Eve told backwards. He hears the voice of God, eats the fruit (choice), and chooses to accept God, with unwavering faith. He comes out of his shelter (like shedding his clothes) and assumes a new dimension. With it comes total enlightenment and benevolence. The ending is not in the least sad or regretful, except that Diamond's family doesn't know the truth of heaven and consciousness's affinity for transmutation. Diamond, through his infinite love, inspired and transformed the lives of those around him. He is loved by all that choose to give him a chance, but only understood, perhaps, by the other enlightened character, his writer-benefactor. MacDonald refers to the Ancient Greeks, perhaps the most recent "perfect" civilization on Earth. The Cynics, like Diogenes, strove to achieve one of the aspects of Diamond's enlightenment: total happiness and connection to self and environment. Today people are basically bodies controlled by riders: We are so out of touch with our senses and selves that it is like riding an animal, much like the drunken boor of a horseman. In the end Diamond sheds his body and becomes one of the frolicking angels. He moved his own rock and went INTO the cave (The reverse of Jesus), but the cave, for him, was HIS heaven or afterlife or rebirth; he found the one that fit and chose to take it. I really appreciated this post. I just found your blog through fb and am a lover of George MacDonald. As the Back of then NorthWind gets nearer (I am mid seventies) I find myself full of curiosity about what it will be like there. I may not look forward to the process of getting there but even so I echo my husband's prayer that we might finish well!